The Warriors team recently headed south to New Mexico to kick off the season. First up was expedition leader training in the Gila Wilderness, southwest of Albuquerque. We were 11 miles into a 12 mile day. About as far from the trailhead that you could be. Twenty-five river crossings between us and our van. We were all looking forward to relaxing around the cooking stoves and campfire and talking about the No Barriers Life. That’s when our expedition leader training got real. 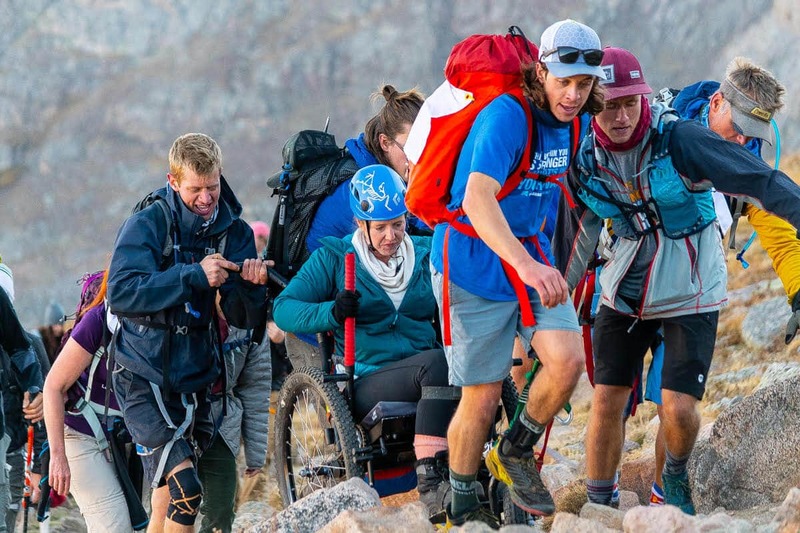 Dave Inbody, one of our alumni expedition leaders broke his leg. Normally, this type of injury would end the expedition, but not for Dave. His foot had been injured by an IED in Afghanistan and had been amputated at the ankle. 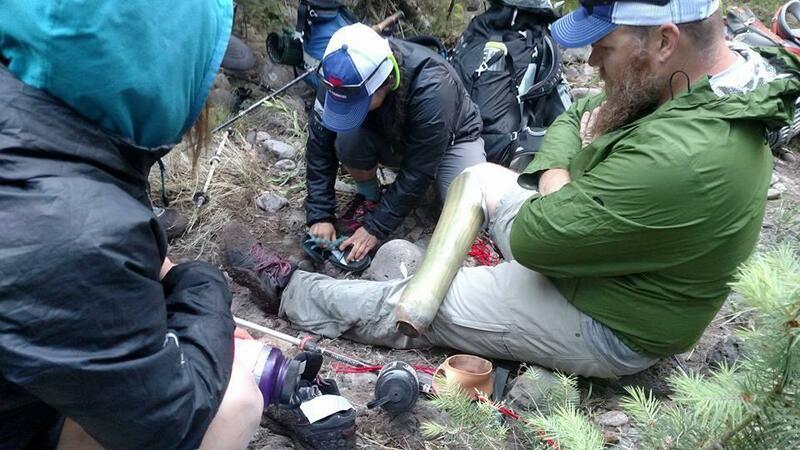 Dave’s carbon fiber and stainless steel prosthetic had logged hundreds of miles through the wilderness, summited many peaks, and completed several No Barriers expeditions. But, it had finally given way, the steel shaft sheering off its anchor in the carbon fiber base. His right leg was now three inches shorter than his left. Not ideal for traversing the Gila Wilderness of New Mexico! The team and Dave went into full MacGyver or Pioneer mode, as we call it. Time to innovate to overcome adversity. We took stock of what we had: the remnants of Dave’s leg, a couple Nalgenes wrapped with duct tape, a couple meters of red Para cord, and our No Barriers mindset. We talked through the options, got creative, and assigned responsibilities. And we channeled our inner Erik Weihenmayer. Derek, our program manager and a core team worked on options while the rest of the team headed up the trail to find a suitable campsite and start getting things set up. The Pioneer group knew they had to rebuild the base of the system. “What if we cut a couple of holes in it and used some Para cord to create a stirrup? We could then lash the old foot to the fiberglass socket” He thought out loud. We tried it out but it still needed more padding and thickness to give it the right shock absorption and height. “How about my flip flops?” Offered Katelyn, one of our newest leaders. “No, seriously”, she said when everyone looked at her quizzically. “We can cut it to fit into the foam shell and tape it into place”. But, when we tried to lash the Para cord to the carbon fiber socket, it wouldn’t hold, the socket was too smooth and the cord kept slipping. “Whose got the first aid kit? Where is the athletic tape?” Dave asked. Gary Dunn, one of our leaders who is a skilled rock climbing guide and knot guru, set to work taping and lashing. After about 15 minutes of tugging and cinching, Dave stood up and tested things out. “What do you think?” asked Derek. “Seems solid, lets see if it will hold up till we get to camp and we can reassess.” Over the next quarter mile and the obligatory river crossing, things held together. The team circled up and discussed options for the next day. The next day included half a dozen river crossings, the hike out of Hells Hole Canyon, and another five miles to camp. The expedition leaders strengthened their rope team as they made their way out of the Gila, armed with renewed respect for Dave and a great story about pioneering to share with future participants.